...... RTF and HTML documentation can be generated from models. A scripting language MetamillScript can be used to access metaelements. Metamill is a native binary, written in C++. This means it opens quickly and runs swiftly. 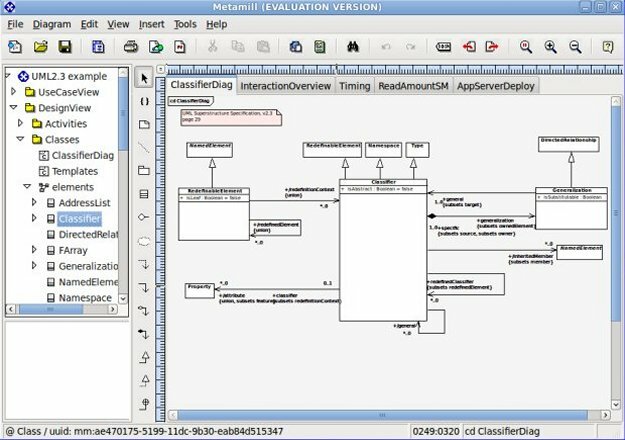 Free evaluation version is available. Here are the Metamill main features. Click on the feature on the table below to read more about the feature. Only the major features are listed here. Download the evaluation version to see them all. Qweas is providing links to Metamill for Linux 6.0 as a courtesy, and makes no representations regarding Metamill for Linux or any other applications or any information related thereto. Any questions, complaints or claims regarding this application Metamill for Linux 6.0 must be directed to the appropriate software vendor. You may click the publisher link of Metamill for Linux on the top of this page to get more details about the vendor.